When it comes to doing accounting work, you have to ask yourself if you have the time to do it and do you know how to do it. If you do know how, and can devote time to do it, you shouldn’t have to worry about it. But if you do not know and don’t have time, you may just need to hire someone to do it for you. Usually, it takes only one or two days to do the work, so not much time is required. As long as you have the receipts and the books, you can do it quickly. Nowadays, everything is done by computer. If you have a good accounting software program, you should be fine doing it yourself. For the sake of argument, let’s say you do not know how to do it. In this case, you will need to hire an accountant to do the work for you. 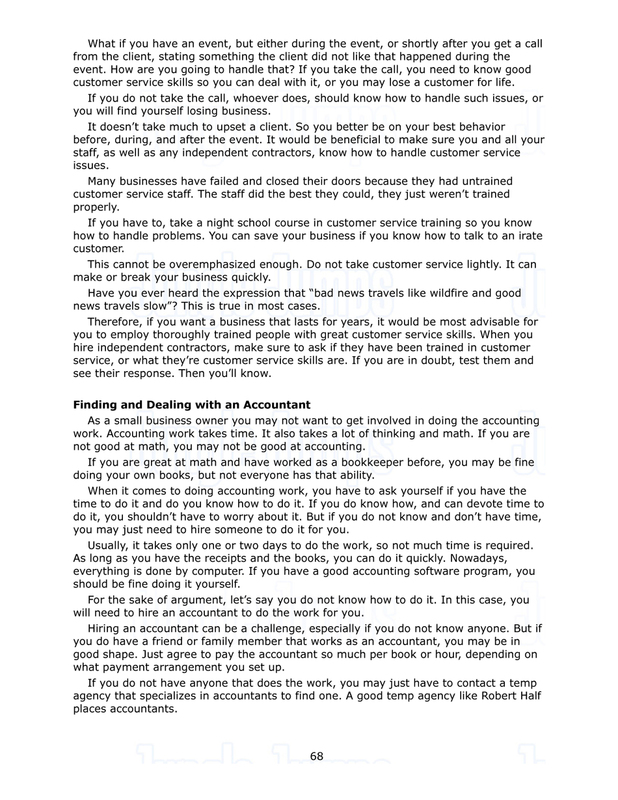 Hiring an accountant can be a challenge, especially if you do not know anyone. But if you do have a friend or family member that works as an accountant, you may be in good shape. Just agree to pay the accountant so much per book or hour, depending on what payment arrangement you set up.If you do not have anyone that does the work, you may just have to contact a temp agency that specializes in accountants to find one. A good temp agency like Robert Half places accountants. The main concern for you when looking for an accountant is experience. Make sure the accountant has plenty of experience, particularly in dealing with small businesses. Experience in the entertainment industry is also beneficial.The person you are considering should have references. Do not hire anyone without checking references. You have to trust the person, since the person will be looking at your business and what you are making. So make sure the person you hire knows what he/she is doing and can do it well. Your business will live or die based on what the accountant does. So be sure the person is good. The best way to find a reliable person is through temp agencies since they normally screen the workers for you. You will have to pay a fee to use the agency, but at least you will get someone who is reliable, trustworthy, and experienced. And that is what you need more than anything. When talking to a third-party accountant, find out if they will do the books manually or by computer. If by computer, do they have their own system or will they use yours. In this case, you may have to teach them. But if you do not have one, you may have to invest in a good program. Seek out and ask questions. Find out what you will need ahead of time before you engage your business. This way you won’t be left flatfooted. Part Nine: Where to Get More Information Membership OrganizationsThere are several membership organizations for the inflatable industry. There are many benefits for joining these types of organizations.Your company will be set apart from the competition - Membership in an inflatable organization will typically allow you to display their name and logo on your web site and marketing materials, implying and stating that you are a member. This will give your company more credibility in the industry and portray you as a professional in the inflatable business.Correspondence from the organization - Many membership organizations will send out periodic newsletters (either via email or print). This correspondence will contain current industry information, including government regulations, allowing you to keep up to date on the industry in a clear and concise format.